A Really Great Buy! Sport Horse Deluxe - Under $10K! Hail Bop - 4 yr old TB/paint cross gelding. Stands 15.3 hands and is still growing. Clips, hauls, bathes, and very easy to ride. At his first show, he won 3rd in the 2'9" Low Hunters, and 1st in the 2'6" Jumpers! He is doing 3' at home. 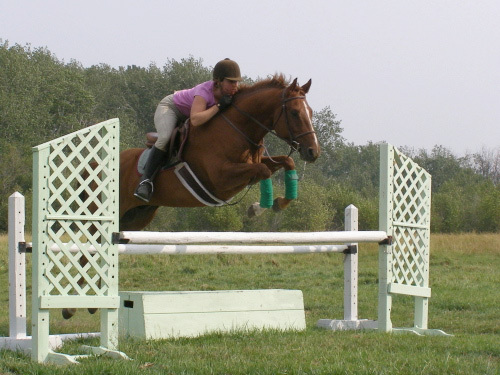 "Bop" is great on trails, has been ridden in the mountains, gone Cross Country, and enjoys everything he has tried. He will make an excellent Youth horse with his fun, willing, personality. A really great buy! Under $10K! "Don't let this sweet, talented, very reasonably priced boy pass you by! Your kids won't forgive ya!" You'll not find this caliber horse for this kind of money anywhere else.